According to the Specialty Coffee Association of America (SCAA), specialty coffees are defined as those qualified with more than 80 points according to their standards, although today it is argued that the minimum score to start talking about a specialty coffee is 85 points. Additionally, there are labels like “rainforest”, “organic”, “fair treatment”; and events like the Cup of Excellence, and lots of information related to quality definition that ultimately seeks to set these coffees apart from generic coffees. It is important to look at these parameters, without a doubt, but in this blog we will discuss in detail how each link in the production chain of coffee contributes to make it possible for us to enjoy a cup of true specialty coffee. The two main mother families of coffee plants are known as Arabica and Robusta. Simply put, the varieties that come from the Robusta kind are varieties with higher caffeine content, greater resistance to pests, have a high yield and grow at low altitude (under 1000 meters above sea level). All this comes at a price: Little aroma and little flavor compared to the Arabica variety. However, when people talk about “100% Arabica”, they are saying very little, since that is only a part of the chain link, a “well-worked” Robusta coffee could very well be better than “mismanaged” Arabica one. 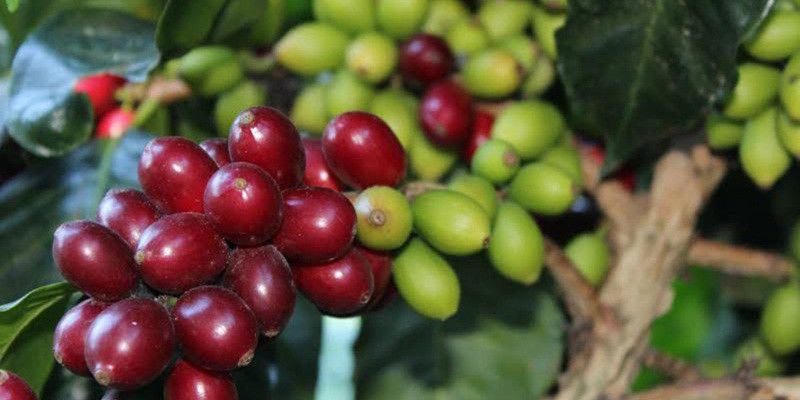 An Arabica variety, needs good nutrition, height, shade and a key help from nature: a favorable climate. All these factors make the fruit ripen slowly and with the proper nutrients; geography is key for the microclimate of a farm, but the macroclimate is always a random variable. Assuming that these variables have been handled properly, all the “quality” of that coffee is enclosed in the fruit (coffee cherry) when it is picked, and it is then that the daunting task of extracting it without making mistakes along the way begins. After the plant has done its part, the hand of man must do its own. In many countries, due to the precarious income conditions in rural areas it is very complicated to ensure the picking of the ripe fruit. Since not all the coffee ripens at the same time, multiple picking rounds are required in order to hand pick only that fruit with a brown tone, at the right point, which raises the costs and prevents many farms from following this procedure. After this selection, comes the transport and storage of the fruit for processing. On reaching the processing area, the first vital decision has to be made: choosing whether the coffee will be processed the wet, natural or honey style. Depending on the selected method, a series of steps need to be performed with extreme discipline to avoid ruining a fruit that comes from nature with all its potential untouched. The “purists” preferred method to keep the taste of the grain intact, is the wet method, however this is not the most environmentally friendly method because of the amount of water it requires. The honey and natural methods are both processes that directly affect the taste of the cup and can lead to very exotic notes, besides being more environmentally friendly. Once the coffee is dry, with a level of residual moisture that allows its storage, it must be protected from environmental enemies, such as heat and humidity. These variables are controlled in the coffee cellars to avoid the emergence of fungi or the generation of stress in the grains that may reduce their final quality in the drink. These variables are so important that many specialty coffee producers vacuum-pack their lots, in order to adequately protect them. The roasting of the grain follows the previous stages. Here it is critical put great care in the reliability of the equipment to use, in the proper management of the temperature and the roasting time, we are in need of a delicate scientific balance that should be handled by real experts to ensure the best results . It is mainly in the clear roasts where the effects of all these variables as well as the intrinsic flavor of the coffee can be appreciated best. The good and the bad are revealed at this stage. If everything has been meticulously managed the result is wonderful, flavor notes of flowers, candy, chocolate, orange, tangerine, peach, etc. If the process was mismanaged, herbal as well as wood-like, cardboard-like, rubber-like flavors, among others, arise. Commercial coffee, due to its its price and massive market, is burned to avoid all these potential problems. Coffee subjected to a dark roast loses any quality or defect and becomes just coffee with very “flat” properties, the equivalent of cooking with lots of sauce or condiments to uniformly cover the whole dish. It is said that only between 1% and 3% of the coffee plantations in the world are actually able to produce specialty coffee due to the intricate process required, but when you take a cup of this wonderful drink, the experience is truly unforgettable.